Glad you went to see Santa? 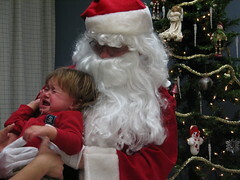 Some years I take the babies and children I work with to see Santa. I love it. They look so cute, the older ones get so excited and nervous; they infect me with Xmassy good feelings. I’m a sucker for Christmas anyway, so it’s not hard to get my good-cheer-meter rising and since I love being with the babies and kids, putting the two together makes my day. If I got to also eat a too-big bowl of pasta while watching TV in my pyjamas at the end that day, I’d pretty much be in heaven.